Pranavah Yoga Studio offers Long Island City residents a zen environment to learn about different mind & body practices in a communal environment. We offer a variety of yoga, Pilates and Feldenkrais classes with every body and individual in mind. 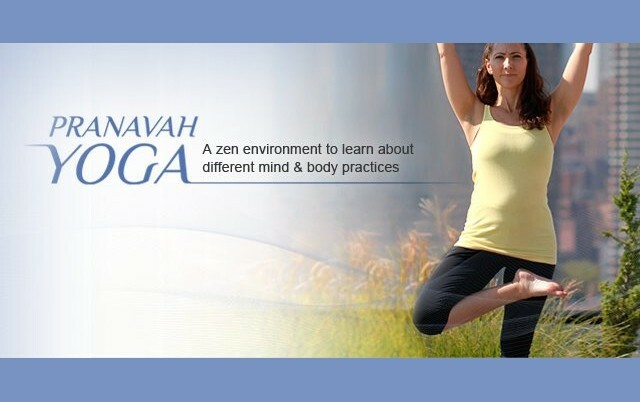 Pranavah Yoga has also carefully designed a prenatal and postnatal mommy & baby curriculum for new and expecting mothers. Our yoga, Pilates and Feldenkrais classes will challenge you to evolve physically, mentally & spiritually. We offer a teaching methodology that encourages insight and leaves you feeling relaxed, restored and revitalized. To compliment our yoga, Pilates and Feldenkrais classes, we offer Music Classes to Babies & Toddlers. If you are 6 months or 60 years old, there is something here for you. You can preregister online. All classes are a first come first serve basis, no membership is required. Our studio offers the best instruction and price in Long Island City and New York City. To find our little oasis in Long Island City, take the 7 train one stop from Grand Central or 3 stops from Times Square to Vernon & 50th Avenue. Walk two short blocks to Vernon Blvd. & 48th Ave. The studio’s entrance is on the 48th Ave side of the street next door to Kata Spa. All are welcome, hope to see you soon! Instructors and class schedules are subject to change without notice. To check availability of classes click “view classes” and access our live calendar. All classes must be prepaid. We accept Visa, Mastercard and American Express. Personal checks are accepted with a valid state ID. A bounced or stopped check will incur a $50 fee with in addition to original payment. All classes are a first come first serve basis. We do not charge gratuitous memberships or fees, all are welcome. Regular group classes start at $20 per class, and prenatal classes start at $25 per class. All classes drops from $25 to $13 per class depending on what package you buy. Music Classes for Babies & Toddlers drops to $13.50 per class. To see a detailed price list, go to our blog page and click on the online store. Select the program or classes of your interest and a detailed price list will drop down. All class cards and packages have an expiration date and are non-refundable, extendable or transferable from one student or program to another. Class prices will vary depending on what group program or package you buy into. Group Classes, Pre & Postnatal Classes, Children’s Classes and Music Classes for Babies & Toddlers are different programs and are priced according to their respective programs. These classes are non-refundable, extendable or transferable from one program to another. Monthly Unlimited Card holders are limited to one session per day. Monthly Unlimited Cards may not be frozen, extended, or transferred at anytime. Cancellations more than 24 hours prior to a scheduled individual session or program class: regular group class, pre & postnatal, and children’s class, will receive studio credit to another individual class or session of equal value. Cancellations within 24 hours of scheduled session will be charged in full and will not be credited. A no show for an Monthly Unlimited Card holder will incur a $10 no show fee. There are no refunds, only studio credit. Workshops: prepayment is required in full at the time of registration in order to reserve your place. Registration can be made in person, online or over the phone. You may cancel a workshop 10 days prior to workshop for a full studio credit. You may cancel 4-7 days prior to workshop and you will receive a partial studio credit of 50%. If you cancel within 72 hours prior to workshop, there will be no refund and no studio credit.